Powerful Call Tracking Software For Agencies, Businesses, & Marketers. Successfully optimize your advertising spend today! Quickly and easily determine which marketing avenues return the greatest amount of calls with the help of call tracking. Toll-free and local numbers available for your business. Do you know which advertising campaign is currently working best for your business? Call tracking software helps you determine the most effective avenues of advertising for your company. Is it the billboard on Main Street? The ad spot placed on the busiest rush hour radio station? Or is it the pay-per-click advertisements on Google? 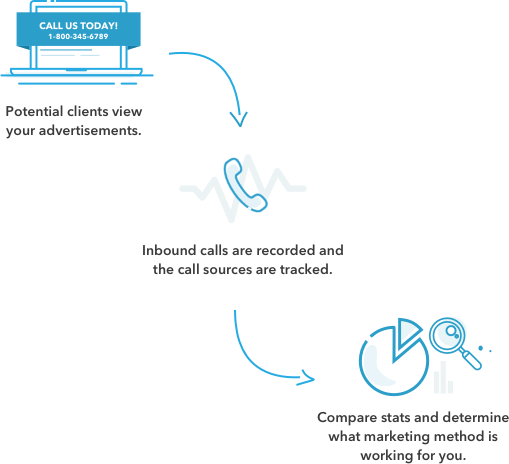 With call tracking, quickly find out which of your advertising campaigns brings in the most calls. Once armed with that information, you can make informed decisions on how to spend your marketing budget. Call tracking software from Caller Insight runs off a web-based user interface, allowing you to log in and check reporting from any Internet-connected device. 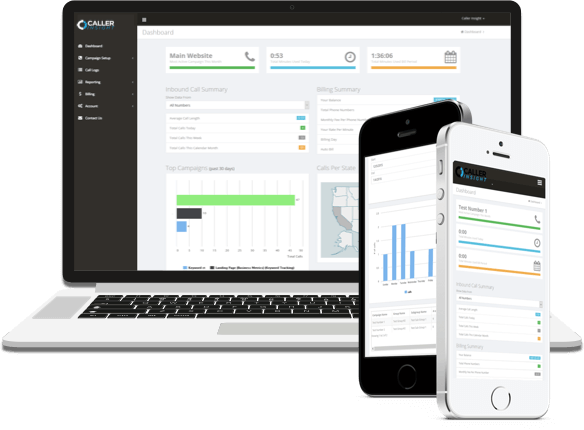 Compare campaigns, test advertising campaigns, listen to call recordings, and more, all from the Caller Insight call tracking platform. Monitor Your Teams, Manage Your Business. Determine the productivity levels between various departments with the help of individual toll-free and local numbers. Audit inbound sales and customer support calls with the help of call recordings and real-time metrics. Kickstart or Overhaul Your Clients’ Ad Campaigns. 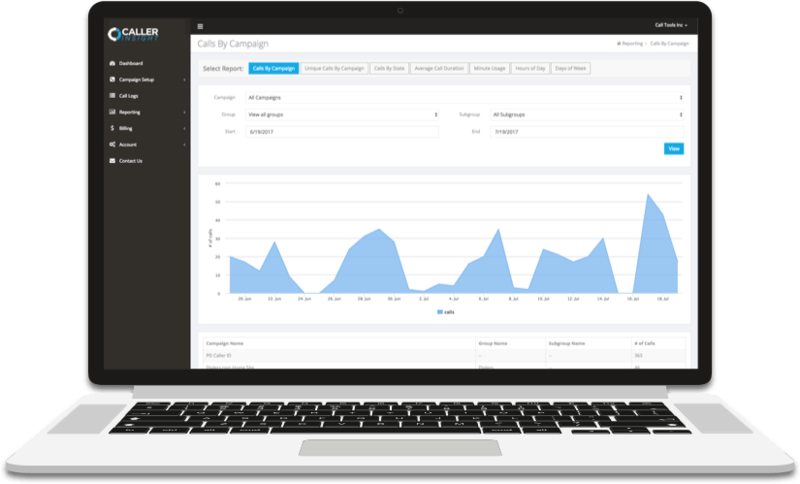 Track client ad campaign performance in real time from beginning to end. Sub-accounts provide your clients access to the data and results from their campaigns while white-labeling keeps your branding consistent in their eyes. Manage and Maximize Your Marketing Budget. Use call tracking to help monitor the return on investment from your marketing campaigns. Detailed data provides proof and ensures higher-ups that they’re making good use of the marketing budget. The most sophisticated Call Tracking System in the industry for a fraction of the price! Real time call reporting displays a breakdown of the number of calls made by campaign or state, average call duration, minute usage, time of day, day of the week, or disposition. Both toll free numbers and local area code numbers are available for purchase directly from the manager’s dashboard. Keep your caller ID pool updated for the best results! If you miss a call, receive an instant alert to your cell phone and email inbox. Make sure you never again miss the opportunity to call a prospect back immediately! If you run PPC ads on Google Adwords, Bing, or Yahoo, keyword call tracking gives you the power to know the keyword your caller searched before calling. Detailed call logs gather data for each call that comes into your center. Find out the caller’s information, the campaign it came from, which agent took it, and the call duration. Call recordings are an important aspect in quality control and training. Caller Insight saves call recordings for 30 days and allows you to save them to your own computer to keep. Say Goodbye to Lost Marketing Dollars.